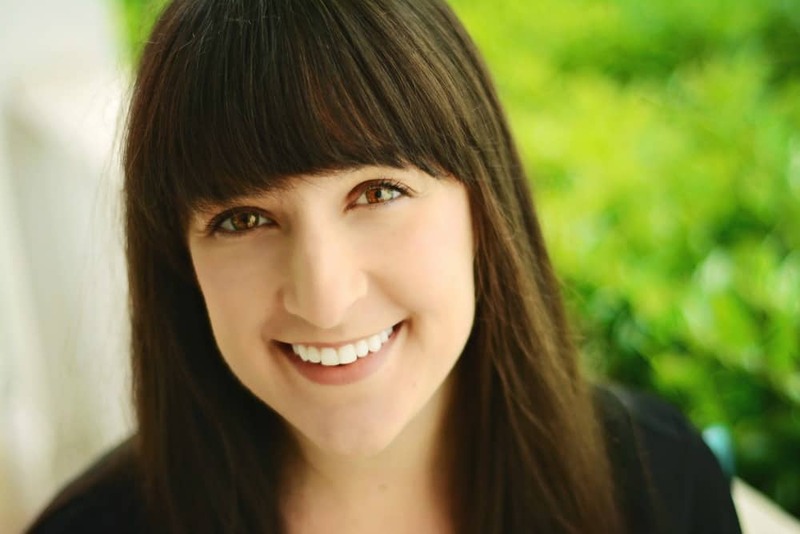 May 21, 2018 By Liz 18 Comments Note: This post may contain affiliate links. 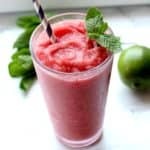 This watermelon mojito smoothie is the best way to cool off on a hot summer day. It’s hydrating, refreshing, and easy to make! The temperatures jumped up quickly here in Richmond, so I’ve been reaching for smoothies on the regular. While I usually go for a banana and peanut butter combination, the warmer temperatures had me craving something lighter and hydrating. The frozen watermelon chunks are a perfect base for this smoothie. The frozen strawberries add sweetness and the coconut water has electrolytes to keep you hydrated on hot days. The lime adds a bit of tang and the mint takes the cooling sensation to the next level. Watermelon is also full of lycopene and vitamin C which are anti-inflammatory antioxidants. Thanks to its high water content, it’s actually pretty low in calories. That means it’s nutrient dense and it tastes amazing, so let’s get to the recipe! If you like a sweeter smoothie, you can add a few drops of stevia or a drizzle of honey. You can add more lime if you like it with more of a tangy flavor. I also like adding a little mint on top for garnish! This smoothie was so refreshing on a hot afternoon. It’s also perfect for after a workout when you’re ready to cool down. I also think this would make a great cocktail base… rum anyone? 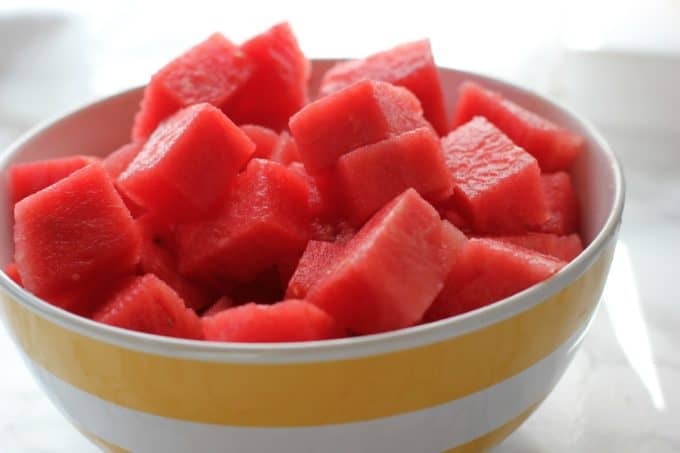 Cut watermelon into 1″ chunks and remove seeds, if needed. Store it in an airtight container or freezer bag. For even faster smoothies, store in individual size freezer bags so you can make an individual serving without having to thaw the whole container. When picking out frozen strawberries, be sure to check the ingredients list. Some frozen brands add sugar, but strawberries are plenty sweet on their own! Make sure you grab a bag with no added sweetener. 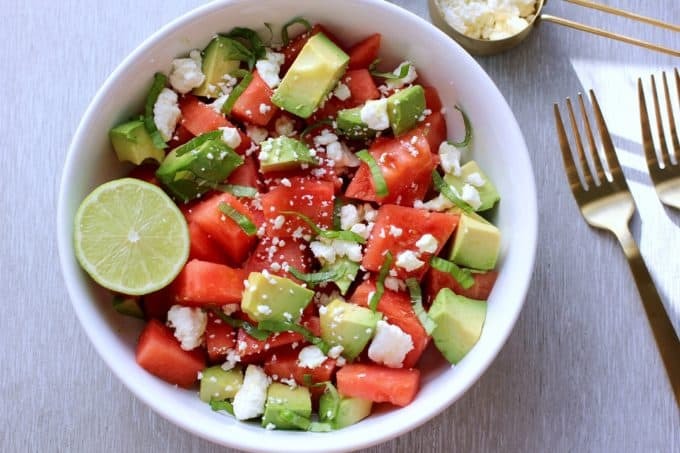 If you’re looking for more watermelon ideas, try this watermelon and feta salad! It’s perfect for a barbecue or picnic! 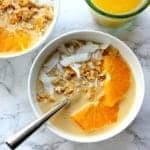 Looking for another low sugar smoothie idea? 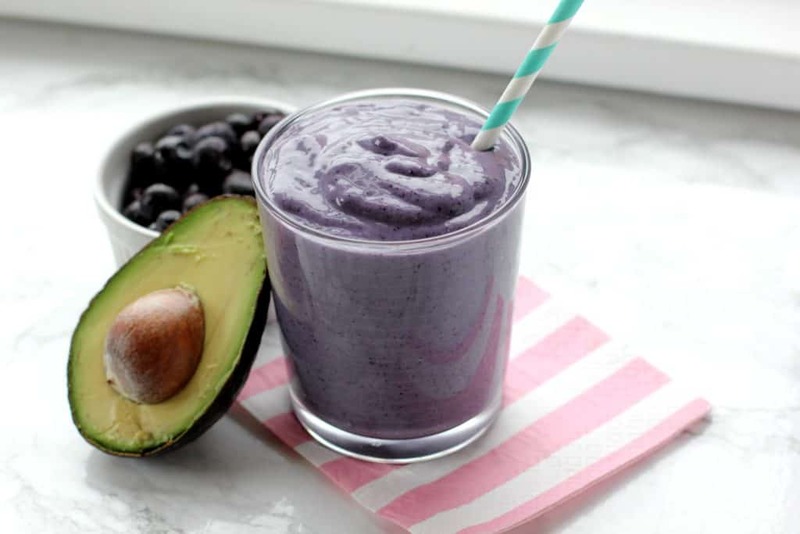 Try this blueberry and avocado smoothie recipe! What’s your favorite way to cool off during the summer? lovely! I love sipping such refreshing drinks in summer. I would love to try out this watermelon mojito.. Yes to this smoothie! I love smoothies BUT with watermelon—now that’s something to indulge in! 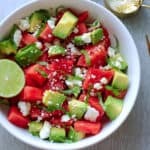 It is getting warm here in the Boston area too and this timely and yummy recipe is perfect for the watermelon season! 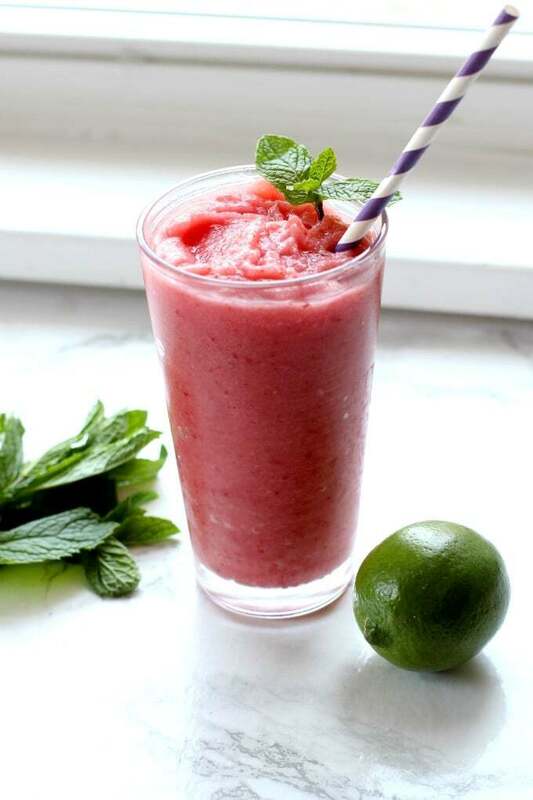 Definitely quite the refreshing smoothie for summer! I am in NoVa and the temps sure did jump here! Just last month we had snow and now it is already 80s/90s. I was hoping for a little more in-between. Yes!!! Virginia is crazy this year! 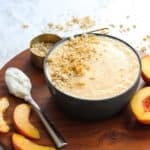 This is such a wonderful summer satisfying smoothie. Now is it wrong of me to think, that adding a nip or two of vodka would make this a wonderful summer frozen cocktail!? Liz – do you buy frozen watermelon chunks like you would with other frozen fruit (and if so, where do you find?) or do you freeze fresh cut watermelon? How long does it stay good for? I just freeze fresh watermelon! I’ve kept mine in the freezer for up to 2 weeks! This smoothie is absolutely beautiful! Perfect for summer. This was so wonderfully refreshing and I will be making it again and again this summer. 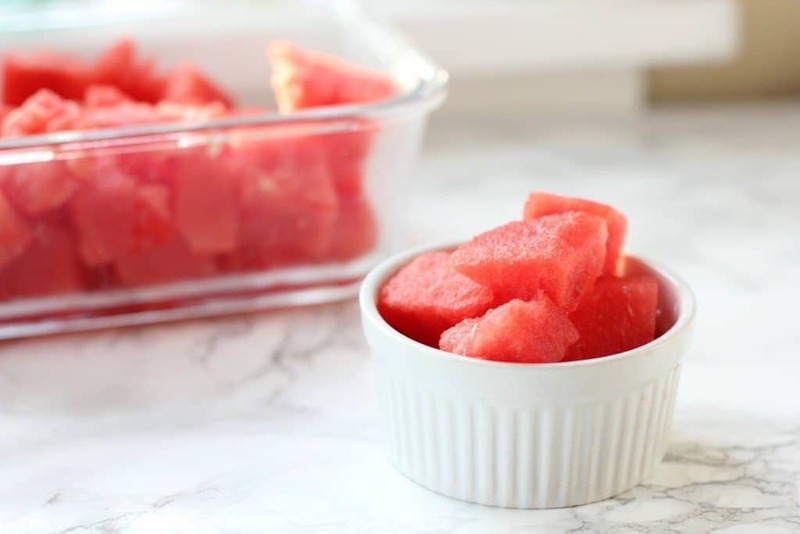 I loved the idea of freezing watermelon chunks. 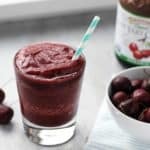 I don’t know why I’ve never done that – such a great idea and now I’ve got a big bag in my freezer so that I can make this smoothie all summer long. Rum!!! Lots or rum! But I’ll drink it as too!!! Looks like the perfect drink to take out onto the deck this summer!! Watermelon Mojito looks lovely & healthy to drink. Thanks to the methods. I absolutely love this smoothie! It is so refreshing and light. Instead of using the coconut water, I used the juice from the watermelon!! (No need to toss it out) Amazingly Delicious! !